PRO STOCK ROUND 2 (2:04 p.m.): In his second season in the Pro Stock class, Tanner Gray will enter the Countdown to the Championship playoffs as the top seed in the Pro Stock class. 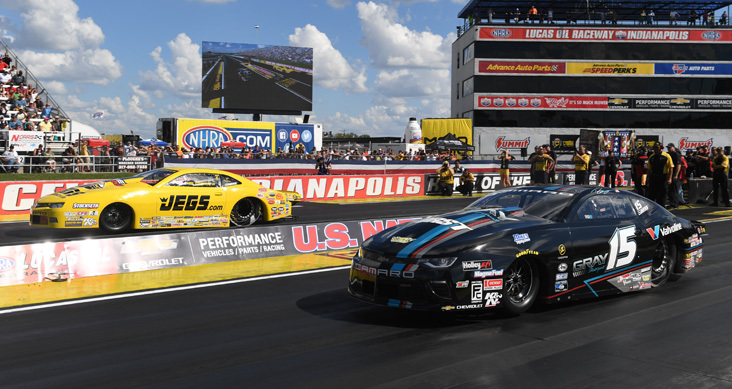 The order at the top of the field was determined during the second round of eliminations when incoming leader Greg Anderson lost to Jeg Coughlin Jr. on a holeshot, and Gray beat three-time world champ Jason Line. Gray will have a 30-point lead on Anderson when the playoffs start in two weeks in Reading, Pa. Gray is also in the semifinals of the sport’s biggest event and will take on defending Indy winner Drew Skillman, who defeated Erica Enders. The other semifinal pairing will feature Coughlin against reigning champ Bo Butner. PRO STOCK FINAL (4:22 p.m.): Tanner Gray, near lane, ran the table at Indy by qualifying No. 1, and winning the sport’s most prestigious event with a holeshot victory over five-time world champ Jeg Coughlin in the final. Gray left first .003 to .023, and held on for the win with a 6.641 to Coughlin’s quicker 6.639. Earlier in the event, Gray overtook Greg Anderson to clinch the top seed in the playoffs. The reigning rookie of the year has now won 10 of the 42 events he’s competed in dating back to the start of the 2017 season. Gray has also won five times in seven final rounds this season and has a 36-13 record in elimination round this year. PRO STOCK WINNER TANNER GRAY:"I think the engine program is in better shape than when we were last year because I'm used to racing five or six races out of the week and that's kind of foreign to some of the guys out here. I honestly wish we could make more runs. So, this doesn't really affect me because I love racing. If it were up to me, we'd add more races to the schedule instead of cutting to it -- I know that wouldn't go over so well with some of the other guys, but that's honestly how I feel about it. This is my full time job and this is what I've wanted to do since I was a kid. "This is one of the top wins for me as well as that Countdown win in Charlotte. That will always be a big one for me because I was a rookie going in there and there was so much pressure one. Everyone from the shop was there and both sides of my family as well." On his dad, Shane Gray, getting emotional at the starting line: "I feel like I'm not a very emotional guy, you know? That can be good or bad. But I think if I win a championship I'll get emotional, but I think for my dad it was just a big deal to see me do something he did four years ago. It's just different to be behind the car and see someone else do something you did."